With double settlement complete, we are now operating in a T+2 regular way settlement environment. The T+2 Command Center greatly appreciates the hard work of many in making this conversion a success. To ensure a smooth conversion to T+2 settlement on September 5, 2017, the T+2 Command Center will provide conversion status information, transparency into the activity of other participants, and serve as a forum for issue identification and socialization. The T+2 Command Center’s support will be most active during the conversion period, from Friday, September 1 through Friday, September 8. Each individual firm is responsible for executing its own T+2 transition plan. Firms should first communicate directly with their clients and suppliers regarding any issues that arise during the conversion period. A firm should address any problem that occurs within the firm or with a counterparty, infrastructure, service provider, vendor, or other intermediaries directly with that entity. The T+2 Command Center is not responsible for issue identification and resolution between individual firms and their infrastructure and/or service providers. The T+2 Command Center will provide a forum for the industry to raise and socialize broad industry issues that are beyond the scope of firm-specific challenges, provide updates, and work with appropriate parties to determine any additional steps required. 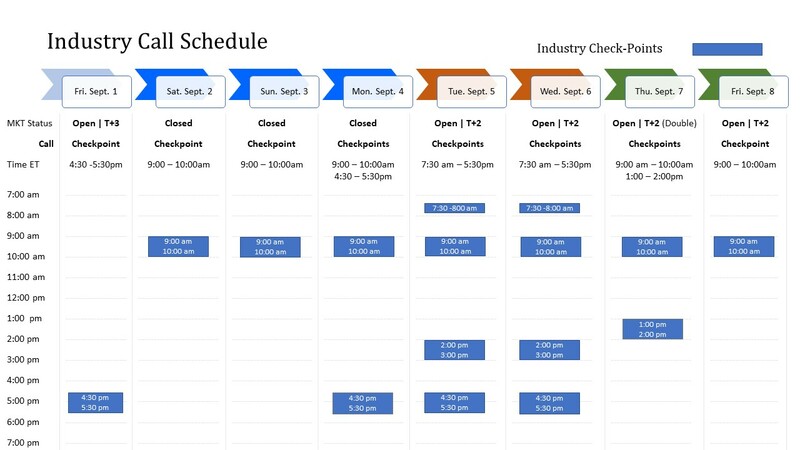 Industry participants should raise such issues to [email protected] or on the industry conference calls scheduled throughout the conversion period. Anonymity – All communications with the T+2 Command Center is strictly confidential. We will not share the identity of the firm submitting an issue unless permitted by the submitting party. Shared firm status information and industry reported issues regarding the T+2 Conversion. 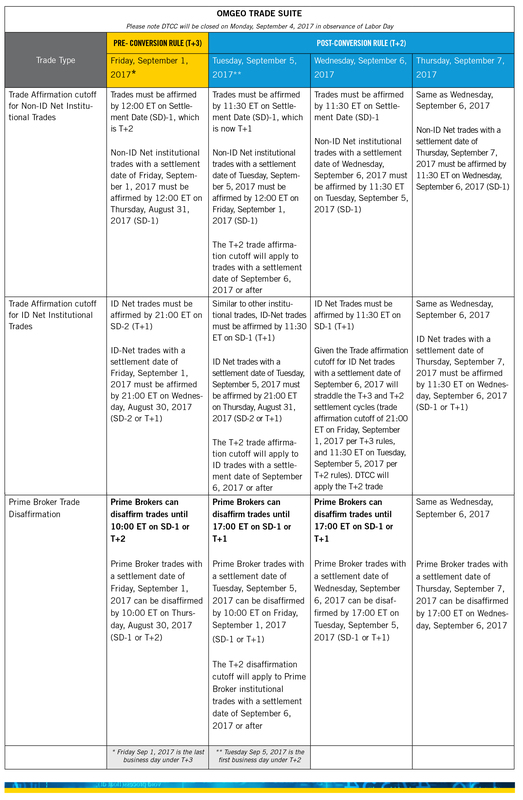 The below tables outline the planned conversion schedules for the DTCC Universal Trade Capture and OMGEO Trade Suite market infrastructures. 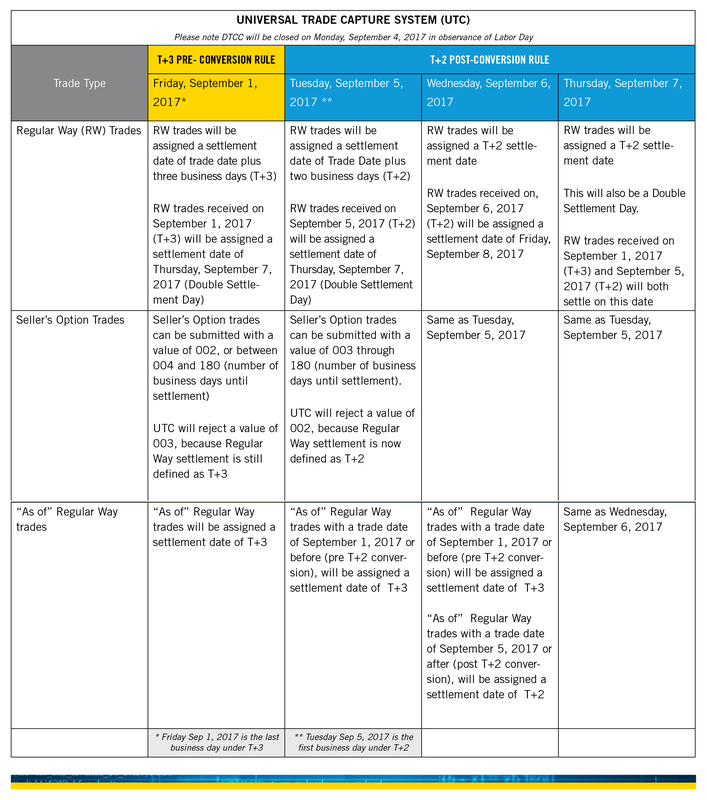 For plans regarding other DTCC systems/processes (e.g., Exchange Traded Fund Creation /Redemption processing, Real Time Trade Monitoring, Asset Servicing, FUND/SERV, and Consolidated Trade Summary), please refer to the DTCC’s Conversion Period Plan.